CWB Chicago: Suburban Police Chief: Cook County "Bond Reform Is NOT Protecting Our Citizens"
Suburban Police Chief: Cook County "Bond Reform Is NOT Protecting Our Citizens"
When Sheriff Tom Dart’s office announced last month that the Cook County Jail population had dropped below 6,000 inmates for the first time in a decade, the media was all over it. The Tribune. CBS. NBC. They all reported Dart’s chief policy officer’s talking points without any counterpoints. NBC even said there was "uniform support for bond reform by the head of the county’s court system, the sheriff and prosecutor, as well as County Board President Toni Preckwinkle." Oddly, not a single outlet seemed able to locate anyone with reservations about the jail story. Like the police chief in west suburban Riverside. He's more than happy to offer his thoughts. Weitzel issued his own press release about the jail population. We could not find any media outlets that have reported on it. Weitzel contacted us after we ran a report Saturday about ten people featured on CWBChicago who've taken advantage of the county’s “affordable bail” program—and then gone AWOL. Weitzel questioned whether the county is even keeping track of the number of affordably-bonded individuals who wind up back in jail while awaiting trial. “There is no independent long-term tracking being done to see if this new bond order from the chief judge is making the streets of Cook County safer,” Weitzel claimed. Weitzel worries that the jailhouse’s revolving door will have a negative effect on cops. 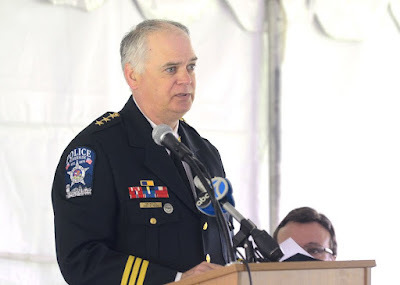 “Once police officers feel that there is no method for offenders being held responsible for their actions, and that includes setting proper bonds, police officers' self-initiated activity will plummet, and crime will rise exponentially,” he predicted.